I am happy to share the species list put together by David Wimpfheimer, Steve Howell and Jules Evens for the trip. If you have any pictures to share, please send them my way! We would love to share them in our next program newsletter and on the Birding Festival website. end of Alvaro’s Adventures pelagic trip to SF waters. Ninth leg of Alvaro’s Adventures pelagic trip to SF waters. Water Temperature 63.8 F. Humpback Whale – 1; California Sea Lion -3. Back in San Mateo county. Eighth leg of Alvaro’s Adventures pelagic trip to SF waters. Blue Shark – 5; unidentified dolphin 15; California Sea Lion 15; Northern Fur Seal 2, Mola mola 3; Humpback Whale 5. Likely a different bird than the one seen a couple of hours ago. Good views, appeared to be in wing molt. All in one flock. Not unusual this time of year. Seventh leg of Alvaro’s Adventures pelagic trip to SF waters. Again, all is SF County waters. Fur Seals – 14. Note that some may have been Guadalupe Fur Seals based on a photo I took, but I am not certain. Humpback Whale – 1. 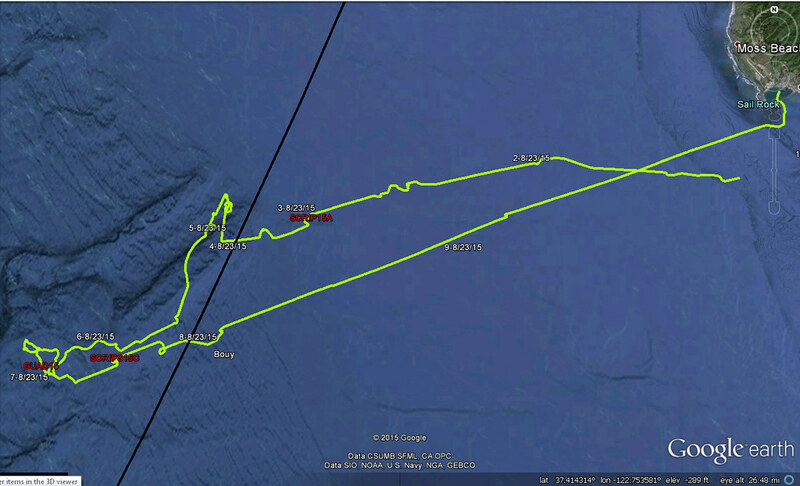 Sixth leg of Alvaro’s Adventures pelagic trip to SF waters. This one within San Francisco waters. Water Temperature 63.2 F. Blue Shark – 3; Dall’s Porpoise – 5; Northern Fur Seal – 12. There may have been more. Various flocks, sitting on water and then flying off to re-sit. Amazingly, the flocks were uniform and no white rumped birds or larger birds present. So all were Ashy! That is unusual as often the flocks have a few other species mixed in. First cycle and second cycle? Others have better photos than mine. White goes above eye, connects to white eyelid. Based on Jehl’s score, a “1” so not the whitest faced type, but still whiter faced than birds considered intermediates (given a “2”, have no white above eye, no connection to white top eye crescent). Comments:With Hugh Cotter, Mark Eaton, Alan Hopkins, Kevin McKeregan, and Paul Saraceni. Overcast and fairly windless day with flat or nearly flat seas all day. Water temperature from approximately 56F – 59.5F. Journeyed west to Bodega Canyon, then south along the 500 fathom line to Cordell Bank. No rarities but numerous Fork-tailed Storm-Petrels and Northern Fulmars a highlight. Mammals included Minke Whale (1), Humpbacked Whale, Northern Right Whale Dolphin (~150), Pacific White-sided Dolphin, Risso’s Dolphin, Northern Fur Seal, and California Sea Lion. With Vince aboard the Miss Anita. Very high numbers for mid-summer. Most (if not all) appeared to be second-year birds molting outer primaries. Amazing mid-summer numbers. We encountered numerous rafts. Most appeared to be molting outer primaries, suggesting 2nd year birds. Perhaps “driven” south by food shortages up north? 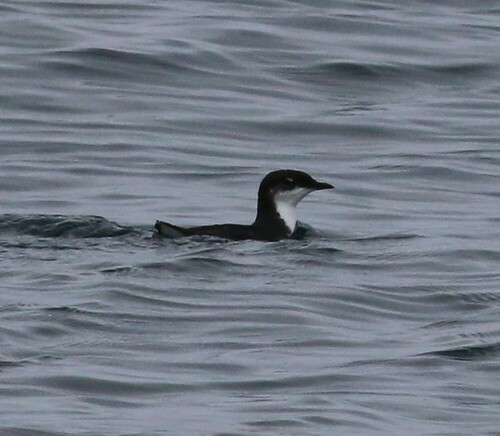 Unusual to see this species well offshore. Good numbers of adults with many showing some red on underparts. Adults that had already dropped central rectrices. Adults; all but one I saw still had full hoods. Two juveniles and one second cycle bird. 9/14/2014 Half Moon Bay Trip report – Bay-breasted Warbler! 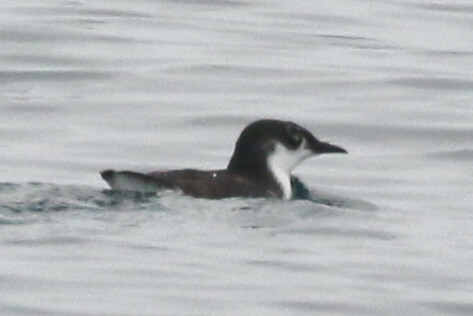 Other highlights included Brown Boobies in San Francisco and San Mateo counties, plumage as well as facial features clarified that two birds were involved. We saw few storm petrels, but three species including Black, Ashy and Wilson’s and all three in both counties. All three jaegers showed up, and three South Polar Skuas, several Sabine’s Gulls and Common as well as Arctic Tern. The jaeger, Sabine’s show was the best we have seen this season. One Common Tern was right inshore, it would have been visible from shore off Miramar! Buller’s Shearwaters have been very scarce, only one appeared but Black-vented was pretty common inshore with many nice views close to Half Moon Bay. A gorgeous Tufted Puffin was seen on the way in, only 6 miles from shore. Two pods of Long-beaked Common Dolphin, Risso’s Dolphin, Humpback Whale and five species of pinniped (seals and sea lions). All on smooth and calm seas! Fun day on the ocean. Trip report can be found here.